HOLLYWOOD, Calif. - Hailed as "exhilaratingly of the moment" (Guy Lodge, Variety), the compelling thriller Good Kill makes its Blu-ray and DVD debut on September 1, 2015 from Paramount Home Media Distribution and will also be available for sale or rental from cable, satellite and telco providers through IFC Films. The film arrives on Digital HD August 14, 2015, more than two weeks before Blu-ray and DVD. 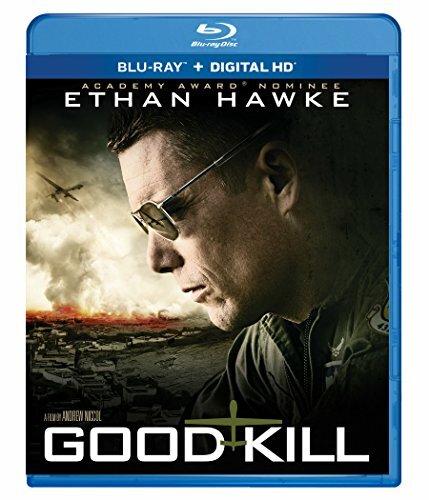 From the producers of The Hurt Locker and writer/director Andrew Niccol (Gattica, Lord of War), Good Kill features "Ethan Hawke's best screen role in years" (David Rooney, The Hollywood Reporter) as a drone operator in 21st century warfare, where combat unfolds like a video game, but with real lives at stake. Veteran Air Force pilot Tom Egan (Hawke) yearns to get back into the cockpit of a plane, but now he launches drone strikes from an air-conditioned box in the Las Vegas desert. When he starts taking orders directly from the CIA, the stakes are raised and Egan's nerves--and his relationship with his wife (January Jones, "Mad Men")--begin to unravel. The Good Kill Blu-ray includes a behind-the-scenes look at the making of this "fascinating" (Ian Freer, Empire) film about the rarely seen world of drone strikes, where operatives target enemies from half a world away. The GOOD KILL DVD is presented in widescreen enhanced for 16:9 TVs with English 5.1 Dolby Digital and English, French and Spanish subtitles. The DVD includes the feature film in standard definition.